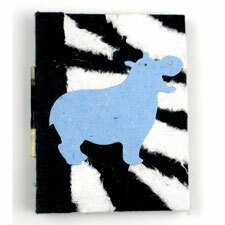 This mini notebook is 3 3/4 by 5 inches in size with a cover made from handmade recycled paper and features a happy blue hippo on the front. Imported from Zimbabwe. Fair trade.